With CMON Feature Friday articles, we like to take a deeper look at both the industry and the hobby of board games. Often, this means examining the human interactions that are so central to gaming, and often this means taking a deeper look at the pieces and components that have become such a big part of the games that we love. In the past, we’ve taken a look at the history of games, dice, and how money works in games. For this week’s feature, we’re examining a component that we now take for granted in games, but one that has a long and interesting history. Playing cards have been around for centuries. They were believed to have made their first appearance in the Tang Dynasty in China in the 9th century AD. The first ‘decks’ had 30 cards in them and were used to play something called the Leaf game. The first recorded instances of suits in card games can be traced to 1294. Throughout the years, different combinations of cards and the games played with them have appeared in historical documents. It was even believed that for a time, cards were both a currency and the tools for betting and playing to win the currency. Early suits were thought to have been Coins, Sticks, and Myriads. Cards were not confined to China, and the use of them became widely spread around the world before long. In Persia, decks of cards were made up of four suits of 12 cards each. The top cards were often the King and Vizier, with numbered ones making up the lower cards in the suit. In Egypt, cards had suits consisting of Cups, Polo Sticks, Coins, and Swords. They were thought to have been used for a simple trick-taking game, but the rules have been lost long ago. Playing cards started to make their appearance in Southern Europe around 1365. As the use of them started to spread to more Germanic countries, the suits used started to take a more familiar form for the first time. Suits like Hearts, Clovers, Pikes, Leaves, and Bells started showing up. Royalty cards started to include a Queen for the first time around 1377. It was common for there to be four royal cards, including the King, Queen, Knight, and Knave, making for a deck of 56 cards in total. Changes and innovations continued through the centuries, like the printing of the value and suit of the card on the corner, which allowed players to hold them in one hand with a tight fan, rather than the two normally required, or the introduction of the Joker, which wasn’t done until 1860 in the United States. Many games like Dixit and Dream On, use cards as visual tools. The game involves how we interact with the images on the cards, themselves. These images can become part of a story, or a storytelling device. Each individual one can create a tale in our minds, which can then be translated to a function in the game. These sorts of storytelling games have become more common recently, in large part due to how well they work with kids. They are great introductions to some of the basic principles of gaming, while still allowing a person’s imagination to flourish. The ability to have an entire deck of incredible art at your fingertips makes gaming flow with kids or adults. Often, cards will have a dual purpose in the game. 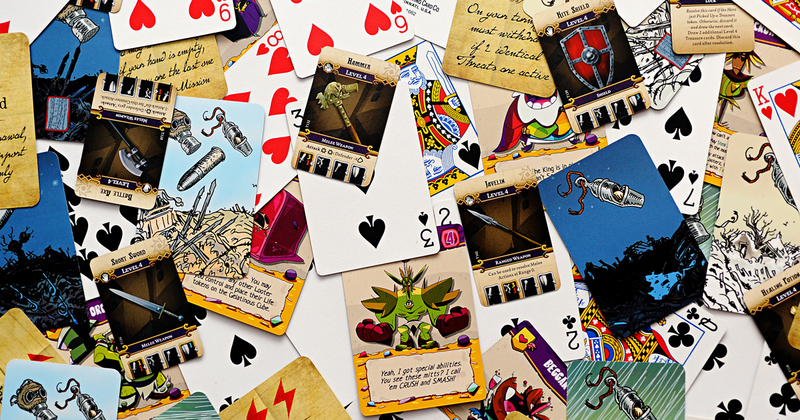 Individual cards may have a function on their own, but the entire deck, or perhaps card line up, can signal either the end of a round or the game, itself. In The Grizzled, players take the role of WWI soldiers trying to survive until an armistice is called. Two different decks determine their fate. The Trials deck stands in their way of making it to peace time. If they can exhaust that deck, they’ve won the game. However, the Morale deck represents their ability to go on. Throughout the game, cards will be forced from the Morale deck onto the Trials deck, pushing the soldiers further from peace and closer to a breakdown of their spirit. In Ethnos, players are drawing cards of mythical creatures to create bands and launch attacks on various regions of the board. They play over three different Ages, and the deck works as both a set collection tool and a timer for each Age. Hidden in the bottom half of the deck are three Dragon cards. Once the third is revealed, the Age ends immediately. The first two are no big deal, but there is a real tension when players draw cards and the third one is still out there. Will there be time for one more big play or not? In many different games, players will take on the role of characters trying to accomplish a shared or competitive task. Especially in CMON games like Zombicide and Arcadia Quest, they are represented on the board by miniatures, each with their own skills and statistics in different areas. A character card can list their abilities in an easily accessible way, and also give you some flavor to their backstory. Throughout the game, those figures will need to search for and acquire different gear if they hope to complete their goals. When they do find items or weapons, cards serve as useful tools to show you just what you’ve found and list the various stats that item has. In recent versions of Zombicide, plastic individual player boards house character cards as well as items and equipment. In this way, you’re able to see what your character has in their hands and what items they’ll be able to share to the party. This is just a small sampling of different ways cards are used in games today. Of course, there are still traditional trick-taking or bluffing games coming out all the time using classic cards or some fantastical new sets of suits, numbers, and trumps. And we can’t forget the enduring presence of traditional card games. Titles like Cribbage, Euchre, Hearts, Bridge, and of course Poker are still widely played around the world. Any card game that can be carried by ESPN is pretty darn popular. We want to hear from you. What is your favorite card game? What are some of the most innovative uses of cards in games in your opinion? Reach out to us on Facebook and Twitter using the hashtag #CMONFeatureFriday and let us know your thoughts.